If a pheasant galette is not enough frugality, here I present game soup ; a sure fire way to make yourself feel good. Good because this is a delicious, refined and just as restorative version chicken soup. And good because you have used almost all the parts of the pheasant you roasted earlier in the week. 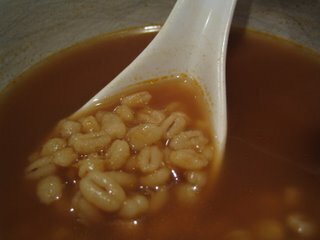 And the barley, not quite the same as the noodle in the chicken noodle soup but barley in the game soup is in many ways better. Barley in a soup makes the soup more of a meal. And this is a great meal with some hot buttered toast! Sauté the vegetables in some fat or oil until they start to caramelise. Add the carcass and sauté briefly. Add the rest of the ingredients except the barley. Bring to a boil then turn down to simmer gently for an hour and a half. Strain well, ideally once through a sieve and then through some muslin. At this point you can chill the soup and then remove the fat from the top before you reheat it. Bring the soup back to a boil and add the barley. Simmer for about 30 minutes or until the barley is cooked.